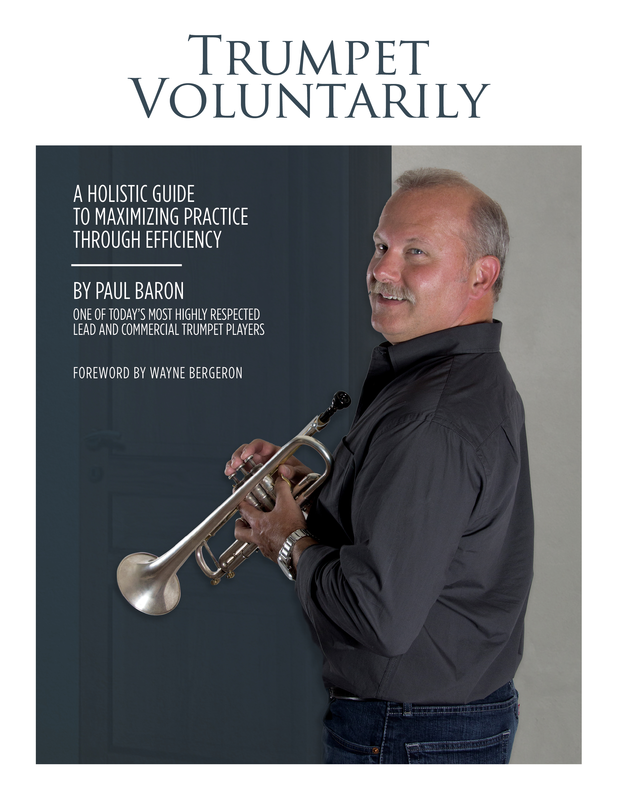 "Trumpet Voluntarily is ultimately a work of generosity on Paul Baron's part: he opens up his own world of experience for all of us to share and learn." Trumpet Voluntarily is a guide book to accompany all the many exercise and routine books already out there. Through many years of road work and playing in the studios, as well as most musical styles, Paul has learned how to use the signals the body sends to practice in such a way as to strengthen without tearing down the lips. Balancing a busy performing schedule with practice is one of the many aspects you will learn about in this book. There are many helpful chapters including "How To Choose The Right Mouthpiece" where Paul breaks down the elusive search for mouthpieces into four easy to follow steps so that you are able to choose "The right tool for the job". There are also chapters on "Lead Trumpet Playing", "Section Playing", "Mute Use And Choreography", as well as many anecdotes and lessons learned along the way on gig etiquette and how to become and stay employable for a long and prosperous career. "Paul Baron and I met at the Pantages Theater in Hollywood, California in 2006. Paul was traveling with the show Dirty Rotten Scoundrels at the time. Living in Los Angeles, I have the opportunity to play with musicians of the highest level on a daily basis. Yes - I’m spoiled. From our first notes together, I realized Paul was a team player and a great section leader. We’ve been friends ever since. In addition to his numerous recordings and live engagements encompassing every style of music, Paul has spent the past several years pursuing a touring career with Broadway shows, traveling from city to city, and often with different musicians in each venue. This type of schedule can make or break players depending on how you condition your chops on a daily basis. The book you now hold in your hands, "Trumpet Voluntarily," is one of the most well-thought-out books on all things trumpet I have come across. Paul’s common sense approach to combating typical problems, as well as learning how to survive in different musical situations, will benefit players of all levels. "Trumpet Voluntarily" covers the gamut of things we all need to learn or be reminded. Paul’s discussion on style, lead playing, section playing, pacing, and maintenance are spot on. I believe this book will be helpful to young players trying to find their way, as well as seasoned professionals." ​Here's what people are saying about "Trumpet Voluntarily"
"Paul Baron's "Trumpet Voluntarily" is a must have book for players of all ages and levels. He covers wide range of topics, chop maintenance, equipments, ensemble playing, how to practice, styles, and even shares his point of view on professionalism. I highly recommend having this book in your library! Congratulations Paul on your great book!!!" Your book is a very serious work!!! we appreciate your dedication and effort to helping us all to be more efficient on our practicing and be a better trumpet player. I really hope that your book gets into the hands of everyone that would like to improve their playing. I'll love to get a copy for myself as soon as it gets available." Best selling book now selling on six continents! Available Here and on Amazon in hard copy and ebook. "Miles Davis once said that he could tell how someone by how they took their horn out of the case. Mile probably meant this more symbolically than literally, but the truth is, there is a lot that can be learned quickly. I met Paul Baron once, some years ago, doing theater work in the Washington, DC area - the details long forgotten - but I do have a clear memory of how impressed I was: his playing combined beauty of tone, impeccable phrasing, absolute integrity of rhythm and style, and power to spare. A wonderful musician, who has rightly garnered the highest praise wherever he has worked. Trumpet Voluntarily is full of long term concepts and also the kind of short-term advice that only a top pro like Paul can give. These real-world insights are well worth repeated readings and study. The day-to-day issues that Paul raises can only come from someone who has "walked the walk" for so many years, and the long-range concepts are expressed with wise perspective, applicable to busy professionals as well as serious college and high school trumpeters. Many confuse "lead trumpet" with the kind of stratospheric pyrotechnics that are often featured in big bands. As Roger Ingram points out in his excellent Clinical Notes On Trumpet Playing, when Cat Anderson was with Duke Ellington and Maynard Ferguson with Stan Kenton, they were not playing lead - they would unleash their spectacular skills on cue when playing lower section parts most of the time. It is true that Bill Chase (with Woody Herman) somewhat changed this template, being asked to cover both duties, but for the most part the responsibility of lead or first trumpet has always demanded detailed and constant attention to leadership in all areas of performance: rhythmic feel, style, pitch, dynamics, intervalic integrity, even comportment on the band stand. Early in my career, I had the great honor of standing next to Al Porcino, and will never forget him playing simple figures in medium swing tempo: the authority of how he would shape a basic figure like four quarter notes, square in a rhythmic pocket that absolutely showed the whole band how it would be playing - there would be a sense of unity all around me in the band. I could even feel a collective boost in morale. Other experiences working with Jon Faddis, Laurie Trink, and Jim Hynes have reinforced this perception, that true lead playing is ultimately about intelligent leadership and the ability to artistically inspire everyone in the ensemble. This quality can also be heard on recordings by the great: Snooky Young, Conrad Gozzo, Al Killian, Wayne Bergeron and others. Milt Jackson once wrote, "Association leads to assimilation". Trumpet Voluntarily is ultimately a work of generosity on Paul Baron's part: he opens up his own world of experience for all of us to share and learn. His book allows us to associate with him, albeit from afar, as an artist and trumpet player, and any resulting assimilation is a gift to be grateful for." "I've had the good fortune to know Paul for 3 decades. Over that time I've witnessed him constantly striving to continually maintain the highest level of musicianship and craft. His book, "Trumpet Voluntarily", is a window to that process. It is thorough, concise and thoughtful volume with advice relevant to any trumpet player. I highly recommend it." ​"I've been waiting for this book for a long time. Paul was my first private teacher, and his passion and knowledge inspired me to follow in his footsteps and become a professional musician. I only wish I had taken better notes as his student. Luck for me, and all trumpeters, his lessons are now available. A must read for all of us who sometimes let this instrument take over our lives." "Trumpet Voluntarily" by Paul Baron offers an insider's view of professional trumpet playing, specifically for theater and commercial work. Think of this book as a survival guide from one of our most successful survivors. The title itself shows a depth of experience and wisdom, as if to say, "this is the passion WE have chosen, so let's make the best of it". Theater or pit work has long been one of the most reliable sources of income for trumpet players, since the days of silent movies. So it is a bit surprising that we haven't had a book appear on the market until "Trumpet Voluntarily", that offers such wisdom for players in this field. The book offers tow major contributions: 1. A thorough presentation of "the issues". Virtually every challenge that a professional theater or show musician is likely to face is mentioned in this book. 2. The author offers his personal thoughts and solutions to given issues, not as "the answer", but as a possible solution based on thought and experience. The book ultimately teaches us "what the problems are" and "how to problem solve". I would highly recommend this book to all trumpet players who want to be more consistent, play more in tune, enjoy their job more, or be appreciated more by conductors and colleagues."